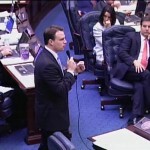 For more than 9 hours last night and into the wee hours of this morning, the Florida House debated the most controversial bill of the year. Senate Bill six ends tenure for teachers and creates a system of merit pay. 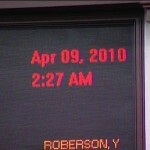 As Mike Vasilinda tells us, more than half of the house spoke before a closer than expected vote. Julio Robaina was one of just a few Republicans who ended up speaking out against one of the top priorities of party leadership. He chided other GOP members for not voting their conscience. �You know what, I didn�t come here to be threatened, or to be told what to do,” Robaina said. Amendments were voted down. Elaine Schwartz worried about the 900 million that will come out of school budgets for test development and merit pay. �Where�s that money going to come from? Guess where� a rise in property taxes,� Rep. Elaine Schwartz (D-Miami) said. Others said teachers shouldn�t be judged on a kid�s performance because those teachers have no control over the child�s home life. 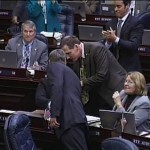 �It is difficult to learn when you�re hungry,” Rep. Geraldine Thompson (D-Orlando) said. But the 67th speaker of the night didn�t buy that argument. By 2:26 a.m., the vote was much closer than most expected. The bill was sent to the governor, where its future is uncertain, despite what legislative leaders say they were led to believe. The campaign for both sides will now shift to the governor�s office. The bill landed on the governor�s desk this morning.� He has seven days to sign, veto or do nothing and let the legislation become law without any action.